Gallery Oldham’s latest exhibition: ‘Peace and Plenty? 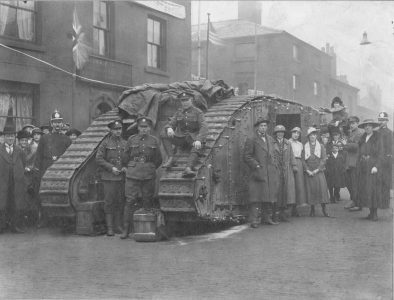 Oldham and the First World War’ takes a fascinating and moving trip back to Oldham in 1918. 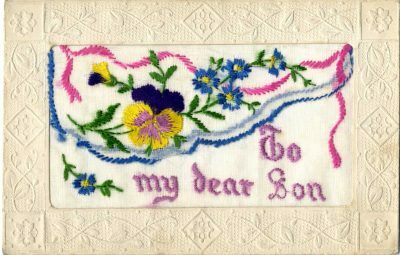 The exhibition looks at the experiences of those in Oldham living on the home front during the ‘Great War’. It examines what life for Oldhamers was like at the time including the harrowing losses they suffered and the achievements they made. 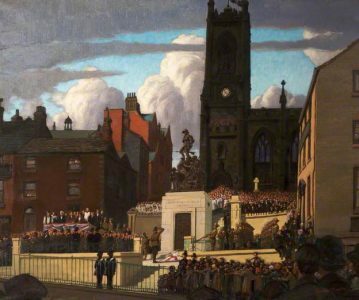 Co-curated by historians, Alan Fowler and Terry Wyke, this exhibition explores how Oldham adapted to meet the needs of the war, whilst also looking at the legacy it has left behind. Every object on display in the exhibition tells a fascinating and poignant story. 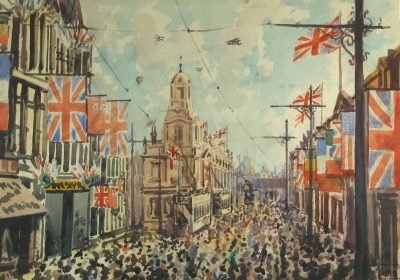 A taster of the type of objects featured include souvenirs sent by a German-born man to his family in Oldham from an internment camp on the Isle of Man as well as James Purdy’s fascinating painting, which captures the unveiling of the Oldham War Memorial in 1923. The exhibition was made possible thanks to a grant of almost £7,000 from the Heritage Lottery Fund. This has enabled conservation work to be carried out on several items from Gallery Oldham’s own collections, including a range of Rolls of Honour from local buildings recording the sacrifices made by local communities. Conservation work has also restored delicate items such as a souvenir paper tissue issued to celebrate Oldham’s ‘Tank Week’ in 1918. Alan Fowler and Terry Wyke have also produced an accompanying booklet exploring the experiences of Oldhamers during, and in the aftermath of, the First World War. The booklet is available to buy from the Gallery Shop. Councillor Paul Jacques, Cabinet Member for Education and Culture, said: “The aftermath of the First World War in Oldham is still evident today as we remember those who fought and died for our country. Acknowledging and appreciating the sacrifices made by Oldhamers on the home front during this time is vital. So, it is paramount that Oldham’s residents of today have access to artefacts from this time and are aware of how Oldham has been shaped as a result. To launch the exhibition a special event will take place on Saturday 6 October at 2pm where both Alan Fowler and Terry Wyke will be present to discuss the exhibition. There will also be readings from Sam Fitton’s dialect poems, which illuminate popular local sentiment about the war.